So I know I'm a year and a half behind but I've finally got hold of Bioshock 2 and had a run through the campaign and I got say, like the original Bioshock, this is a bloody good game! 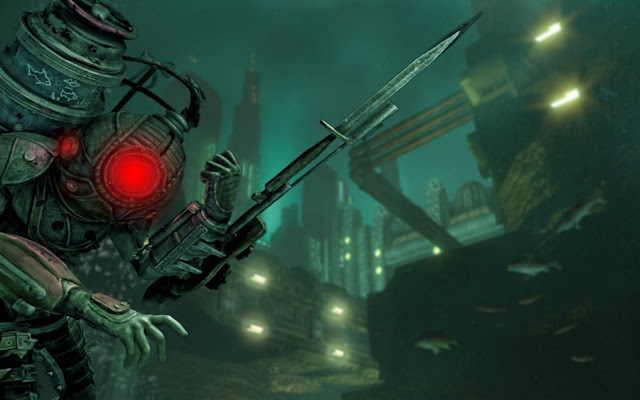 Set some 8 years after the first decent to Rapture, Bioshock 2 begins with you as a Big Daddy (known as Delta) facing your foe. As you induces you to commit suicide using hypnosis you immediately what kind of hell hole have you found yourself, is it Rapture's own version of the Devil's Dungeon? Game play is based on the original BioShock, where the player Delta explores the city of Rapture and fights off Splicers,other abominations, the remaining psychotic and deluded human population of the city, using a combination of the environment, weapons, Plasmids and Tonics. I found myself favouring the electrical plasmid, the shotgun and the spear gun as my weapons of choice. The real fun to be had its mixing it up with the differing kinds of ammunition, the burning phosphorous shells being an effective show stopper. The story line is intertwined with the original tale of Rapture in the sense that the struggle between Andrew Ryan and this game's Antagonist Sophia Lamb is the back drop to your attempt to rescue your daughter Eleanor. This time the game focuses on a discussion of a kind of socialism / religion that would determine a new Utopia as opposed to Ryan's rhetoric of a free market with out principle or rule of law. Is Sophia really your daughter? Is this a fake out like the classic Would You Kindly? from the original? Who is going to double cross me? Should I let this Old Lady die? What about this Child Kidnapper? Should he be made to suffer for his actions? These are some of the questions that Bioshock 2 asks you to think about and even act on. There are plenty of occasions when you have no time to think but merely react - this is when the Big Sisters come for you. As you venture through the game, your Little Sister can obtain some Adam for you - the Big Sisters do not want you to get the Adam (as you become stronger) so they come to attack - the are relentless screaming banshees that do not stop until you are dead or they die trying. The Big Sister attacks make for a delightful gaming experience, and kudos to the game designers for introducing this new facet to the game to mix things up. While it's always fun to take on a rampaging Big Daddy, they simply aren't scary anymore when put up against the Big Sisters. The music that accompanies a Big Sister attack is simply a perfect mix of conveyed terror and danger - indeed the music of Bioshock 2 is an absolute triumph. Overall Bioshock 2 is a damn fine sequel to what was a refreshingly original piece of gaming adventure. People without brains can play it for it's run and gun appeal whereas those with some life learning or education can enjoy the fantastic story - not since the last Bioshock game have I really had to think - sure Mass Effect asks you to make choices along the way, but Bioshock has the edge in engaging my mind. I think Bioshock Infinite has a lot to live up to after this game. Hopefully it's story will be as appealing as both Bioshocks have been. For this gamer, I'll definitely be getting it so as to have another chance to play with the magic of the Bioshock series.